The salmon has a specific strong flavor and can be recognized very easily after its orange-pink meat. 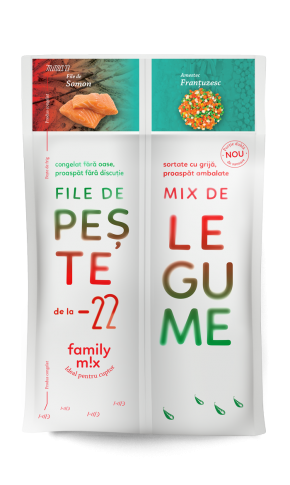 The French mix contains carrots, peas, potatoes and parsnip for a colorful culinary experience. Salmon fillets are sliced immediately after being fshed and frozen quickly for a long-lasting freshness. The vegetables are carefully sorted and frozen fresh through the Quick Freezing method. This way they retain all their nutrients and vitamins. Recommendation: the fish should be defrosted in the refrigerator a day before cooking. Don’t use the microwave or water. This way, the fish will keep its structure, flavor and nutrients. The vegetables do not require defrosting before being cooked.